We are no longer accepting soil for testing. See the link below for other testing facilities. GrowNYC will be offering $5 soil pH tests from now until Friday, April 1st. Make checks or money orders payable to GrowNYC. Please note that we will only be testing your soil's pH. More information on where to get your soil tested for toxins and chemicals can be found at Grow to Learn NYC's soil testing page. How long have you been tapping maple trees? It corresponds pretty well with how long we’ve been at Greenmarket-- since 1986. 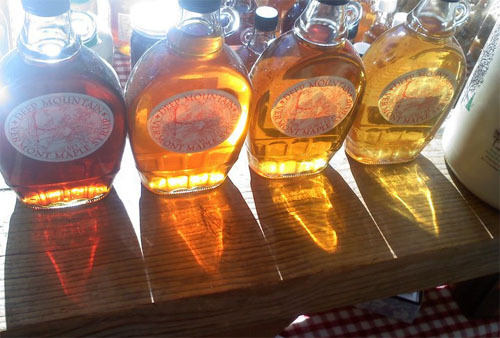 We’re going into our 27th season of selling new syrup at the market. The first market we ever did was Union Square Friday. That first year, we just sold for a few weeks in the spring. We didn’t know how we’d do at the market, but we expanded our season over the next few years, and then it became a year-round business. We’ve been there on Fridays ever since. How many trees do you tap? Over 5,000 taps, we’ve done some expansion this year, and we’ve taken on a new sugar bush just up the hill from us, it’s on the same hill our bush lays across. It’s a beautiful piece of land which belongs to a friend and neighbor. When we first started, we sugared from a sleigh pulled by horses, and collected the syrup in buckets. The next year we bought the piece of land we now call Deep Mountain, and we eventually switched over to tubing, because with thousands of taps to collect from, to try and run an efficient business on the sled…it was impossible to keep up with production. Can you describe the process of ‘sugaring’? Sugaring—you either love it or you don’t. You get real connected to the change of seasons this time of year. And you go kind of crazy—the sap is controlling our lives right now! You get all the taps set up, and then you just wait. The thing is, sap is really unstable, as soon as it comes out of the trees micro organisms will start breaking it down so you want to boil it as soon as possible. Tapping is the process of putting a hole in tree with a spout, attached to a tube. Sap runs through the tubing into yet a bigger tube, and then an even bigger tube (the mainline) which runs to the sugar house where the sap empties into thousand-gallon tanks. The tubing is just 1.5 inches wide, so I always tell people it’s like you’re plumbing the woods. In the sugar house, the sap boils down in two pans which are six feet wide by 16 feet long. They rest on a framework called an arch which is centered around a wood fire. You want to boil the sap as hot and as fast as you can. It takes about 40-60 gallons of sap to make one gallon of syrup. The whole process is just simple reduction, reducing sap to concentrate. The specific density of the syrup is measured with hydrometer. When do you know that the sap is ready to run? Well, you’ll see the first sap in the tubes-- it’s the miracle of spring and the miracle of sugar maples. The Sugar Maples is a deciduous tree that stands dormant all winter. Its molecules are surrounded by carbon dioxide gas (not water like most trees) so what happens in the Northeast in the early spring, is that you get a succession of days when it warms up above freezing, but at night it drops back down below freezing. So you’ve got this thawing and freezing thing going on. It causes the gas to expand, and escape out through the branch tips of the trees. At night when it freezes again, the gas retracts. The tree then acts like a giant pump, pulling water from the ground and minerals from the soil to create sap, which is the food for the new leaves that will be sprouting soon. It so happens that the sap early in the spring has lots of flavor compounds, and they’re all good—nothing astringent, that’s why you can boil it. The sap has a very high sugar content, 1.5%-2%. Later in the spring, once the budding on the tree has started to occur, the tree releases new compounds in the sap, changing the sugar content, and making it increasingly bitter. When the trees are about to bud is when you stop collecting sap. I am no scientist, I may not get this all perfectly exact, but this is how the process has been explained to me. How many gallons of syrup will you produce in a good year? We hope for a season that’s five to six weeks long. This year we hope to make 1700 to1800 gallons of syrup, but that’ll be a good year if we do. There are variables that do affect our production season—foremost, how much precipitation we’ve had in the last year. If we’ve had a lot of moisture in the year leading up, that’s really good, the more water there is in the ground, the better it is for the run. Snow cover is good too. That’s going to keep the conditions colder, longer. What we want is to extend this transition into spring, which drives some of us crazy! Honestly what I really wish is that the sun would come out and the daffodils would come up in my yard, and I could sit on the porch. But what I have to wish is that we get a big wet snow in April. Low pressure systems give you get the best runs, so you have to wish against your intuition. You were able to attend Terra Madre in Tourin, Italy this fall as a Greenmarket delegate. What was your experience like there, and how has it affected your business? We had a tremendous experience at Terra Madre. Howie and I were really moved by the whole thing—what Slow Food is doing, the trip to Italy, and learning about the transformative work that people are doing all over the planet. I was particularly struck by this simple idea that there are chefs and food activists and people doing small-scale food production all over the world. If you can get 5,000 of them together, and provide some loose structure, they’ll talk to each other and figure things out. Every single person there is doing something interesting. I guess the word that comes to mind is affirmation. Sometimes, doing what we do, making syrup the old fashioned way, because we believe in the process, we face some intense pressures. Maple sugar making is under some real pressure to change. Most of it has to do with new technologies, so we struggle to keep doing it the way believe in. Sometimes we look at each other and say ‘Are we crazy?’ We truck it all the way down to Greenmarket, instead of selling the business to Proctor and Gamble. I never doubt what we do, but sometimes I wonder, you know, if we aren’t kind of nuts. First, I’m so grateful to Greenmarket for thinking of us to represent the organization at Terra Madre, and we’re also just so grateful for the opportunity to go there and be reminded that we’re not the only ones doing this kind of work. It’s really important to be reminded of why you do what you do, when a lot of the time it feels like a drop in the bucket. Just in terms of the big picture, the view of what Greenmarket has accomplished in 35 years is astounding. I think of the founding farmers who were the true pioneers, and even 27 years ago when we started, we were on the cutting edge of this awareness about where our food comes from. Every single person, three times a day, can make a real choice about our food system! Terra Madre helped me to know all this with more certainty. We brought that spirit home, and we feel like it’s re-inspired us to do what we do at Greenmarket and how we run our farm, and how think about the choices we have to make going forward. Did you meet any other maple syrup producers while at Terra Madre? We were the only maple syrup producers at Terra Madre. It was the indigenous people in the Northeast who first figured this [the process of tapping and reduction] out, and how to do it, and they taught the European colonists. We meet people at the market all the time who don’t know what maple syrup is. That’s been a big part of our whole stint at the market—explaining just what maple syrup is, how it’s produced, and how it’s graded (it’s graded by color, lighter batches are more delicate but more complex than the darker grades). I’ve explained many times over it in English and in Spanish, that’s the extent of my language skills! You used to work with Bread and Puppet Theatre, is there any connection between your life as a puppeteer and the work you do now? Howie and I met at Bread and Puppet, I wouldn’t be in Vermont were it not for Bread and Puppet. There is a sugar bush on the Bread and Puppet farm, and that’s where Howie sugared just before we moved to Deep Mountain. The Schumanns, who founded Bread and Puppet, had a sugarbush behind their house on the old farm, and no one was doing anything with it so Howie asked if he could sugar it. I also learned that art is food, it feeds you, that’s why it’s called Bread and Puppet—look we all need to eat and we all need art in our lives. On Monday, March 7th, Greenmarket staff, farmers, and community members came together for the 2011 Greenmarket Annual Meeting. Every March, the Greenmarket community gets together to present the previous year’s accomplishments and discuss what the next season has in store. Over 230 farmers and producers attended the meeting. One thing is for certain: everyone is ready for Spring! 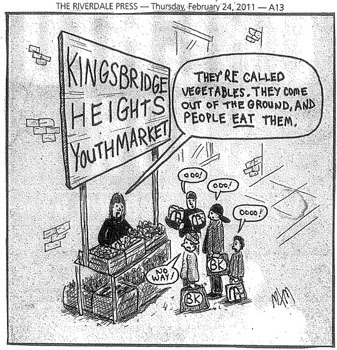 Cartoonist Michael X. Martin recently featured GrowNYC's Kingsbridge Heights Youthmarket in a cartoon for The Riverdale Press. Check it out above! The Kingsbridge Heights Youthmarket will be open on Fridays from July 8th to October 28th. Stay tuned for more info throughout the summer! This morning, City Council Speaker Christine Quinn unveiled a a 4-month pilot program to expand current food scrap collections from NYC households at six additional Greenmarkets. A pilot program will allow New York City residents to compost food scraps at six new Greenmarket locations. New Yorkers will now be able to drop off fruit and vegetable scraps for composting at 10 Greenmarkets in Manhattan, Brooklyn and Queens. Read about our expanded compost program.